Rather than translate the Switch news story of today, March 24, I'll provide a brief synopsis. The shoot took place on the 25th of last month. 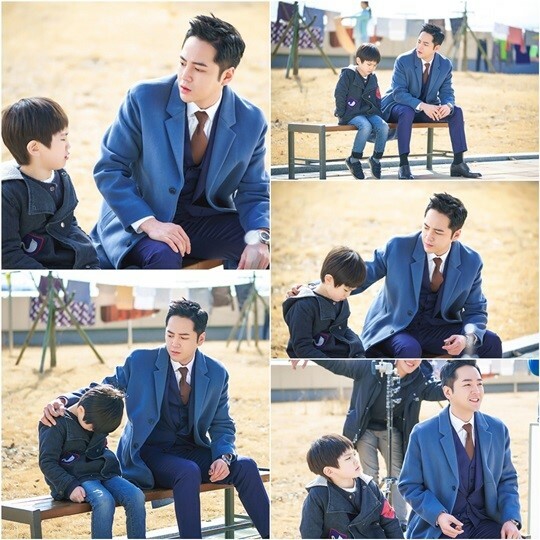 In the scene, JKS sits on a bench with a young boy and holds an earnest conversation. The child is crying and, at firs,t Sa Do Chan gives a pretty mischievous look to build the child's courage and give him comfort. As the conversation continues, Sa Do Chan looks at the child with glazed eyes and shakes off his own tears as he listens to the child's words and, then, pats the boy on the back and shoulder. When JKS arrived on the set, he greeted the actors and crew with his usual broad smile and humor, but before the scene took place, he sought out the child actor. The young actor appeared nervous and unsure of himself, so JKS worked his magic, cheering the young actor up. For that reason, JKS was given the nicknames of "Uncle Gentle" and "Uncle Smile." JKS' reassurances not only helped the young actor perform his lines but also calmed him down. JKS comfortably led the atmosphere so that scene went off well. JKS remarked afterwards, "He is so cute." The production crew said, "Jang Geun-suk is a first-class actor who takes a lot of passion for each scene, as well as a scene that captures the scene, as well as making the scene atmosphere cheerful," said Jang Geun-suk, who is doing his best in the filming scene. Please expect it. "